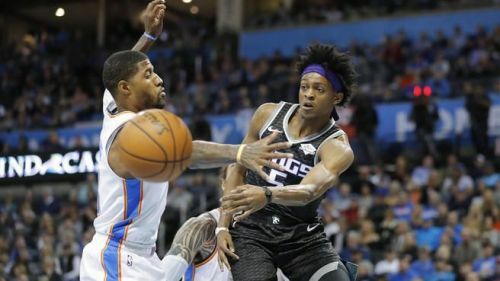 Coming into this one, the Sacramento Kings had dropped two straight to Western Conference leaders Golden State Warriors and Denver Nuggets by a total of just four points. Understandably so, they had what it takes to beat reputed squads but were not able to pull through down the stretch for a win. Well, that changed when they met the West's 3rd seed in Oklahoma and willed themselves to an emphatic 119-116 win on the road. Coach Joerger and co. look solid in their late playoffs push as they find themselves 1.5 games below the eighth seed Clippers. "A game ago, it's, `Oh my gosh, we're so close," Kings coach Dave Joerger said. "We had the Warriors. We feel like we had the Warriors, and then they got away. So it's a little bit of relief, also." On the other hand, the Oklahoma City Thunder have now lost three of their last ten matchups, still steady at the third spot on the West leaderboard with a 38-21(0.644) win-loss record. The win for the Kings brings them to 31-28(0.525) on the season, though still down at the ninth position. Let's draw out some key takeaways from this respectable show of resiliency by the Kings against one of the best defensive teams in the league. D'Aaron Fox is averaging an impressive 17.2 ppg this year. The recent NBA drafts have bestowed Sacramento with quality young talent. Two of such products appear in sophomore D'Aaron Fox and rookie Marvin Bagley III. 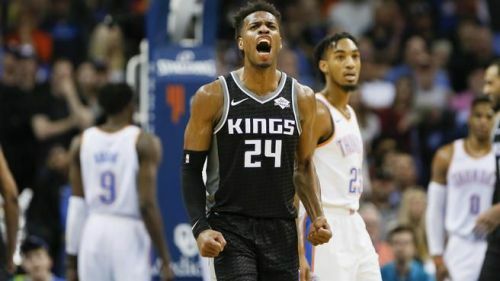 In this nail-biting clash, both contributed 19 points each to the Kings' winning cause while Bagley also recorded 10 rebounds coming off the bench. Moreover, the duo combined for 3 steals and 6 blocks for their team on the defensive end. Buddy Hield is averaging career-high numbers in scoring this year, and his team-high total of 34 points was just another reminder of the same. He shot an impressive 12-of-22 from the floor whilst playing a team-high 36 minutes in the game. "It's big, especially the way Russ and PG are playing," Hield said. "They're playing great. They're a great team, great defensive team, and we came out to be resilient."